Are You Committed To Content Marketing? Corporate commitment to content marketing is key finding of Content Marketing Institute/MarketingProfs’s 2017 B2B Content Marketing Research. On the content marketing maturity scale, roughly one third are mature, one third are midway there and a third are starting out. Look beneath the 89% of North American B2B companies to appreciate what’s required to be a content marketer in 2017. When it comes to content marketing success, there’s a marked difference when you look at the most successful, the average and least success marketers. 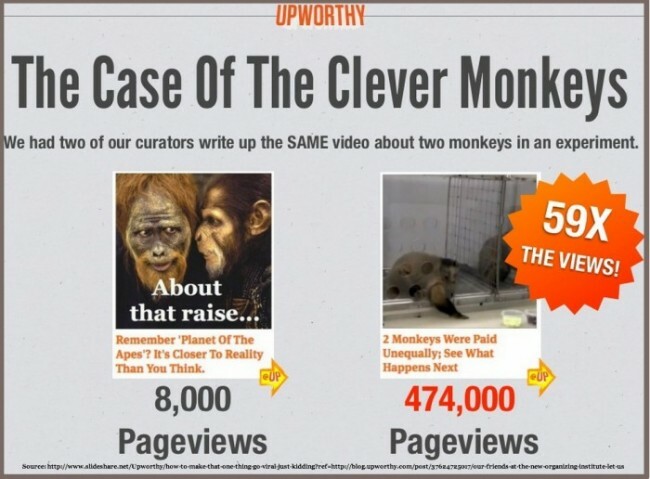 Know what a successful content marketing looks like. Be committed to content marketing success. Allocate largest proportion of marketing budget to content. As content marketing matures as a business process, your business must commit to achieve continual success. This separates you from your peers. Your marketing team not only has to understand and recognize successful content marketing but also have the management support (both personnel and budget) to succeed based on 2017 B2B Content Marketing Research. To create quality content that yields measurable results, your organization has to understand what successful content marketing is. Create information your audience needs. Deliver it when and where they want it on the device of their chose to achieve specific desired outcomes for your business. 81% of the most successful content marketers are clear on what a successful content marketing program is. 41% of average content marketers are clear on what a successful content marketing program is. 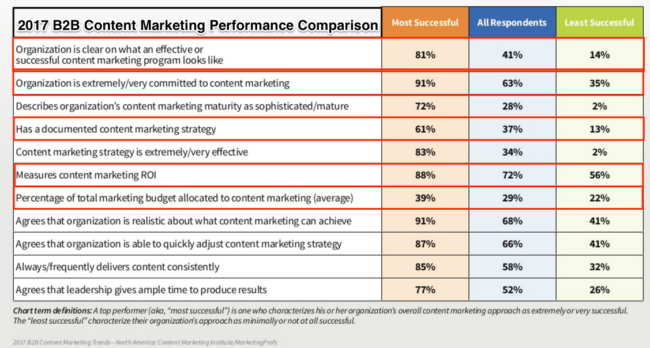 14% of least successful marketers are clear on what a successful content marketing program is. Content Marketing Institute/MarketingProfs’s 2017 B2B Content Marketing Research is a great example of 10X content. They provide this useful research marketers and business executives need on an annual basis. Further, they’ve expanded their research locations and focus. In addition to their analysis, Content Marketing Institute supports their research distribution with PR and influencer outreach. Your company needs a clear, guiding principle everyone easily understands. Go beyond your employees to include your audience. To ensure that everyone’s on the same page, skip the corporate-speak. 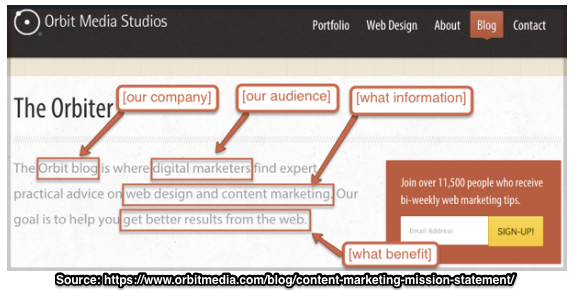 Document and distribute your content marketing mission statement. Ensure it’s aligned with your business goals and be measurable. For Orbit Media’s Andy Crestodina, your editorial content marketing mission is the overlap between your business goals and your audience’s needs. Orbit Media publishes their editorial mission at the top of their blog. It took less than an hour to create and focuses his team’s content efforts. Quality content marketing takes a community. Content marketing involves more than the creative production. It crosses products, functional areas and job titles. To this end, c-suite level support is useful. Senior level support provides personnel including employees, freelancers, consultants and/or agencies. Additionally management leadership gets diverse departments and employees involved in content marketing across your organization. Related technology and analytics support. Ideally, cross-functional teams reduce redundant work, especially between marketing, sales and customer service. 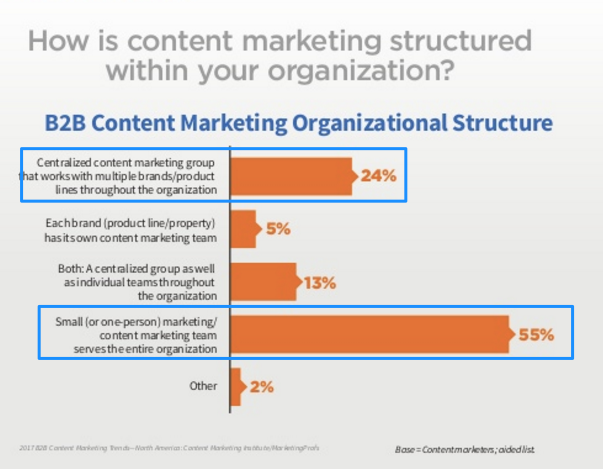 24% of respondents have a centralized content marketing group across product and organizational areas. 55% of respondents have a small content marketing team, often 1 person. Management also yields additional content related budget. This may include better quality content elements, optimization support, employee training, specialized marketing technology and paid distribution. Content marketing doesn’t exist in a silo by itself. To be a best-in-class content marketer based on the 2017 B2B Content Marketing Research, your content strategy must be incorporated in your business strategy and plans. Ideally integrate your content marketing editorial plan with the rest of your marketing, communications and promotional plans. Goal: Take advantage of existing marketing investments to create related content. Include options to atomize your content. (Hat tip: Jay Baer) This means to reuse your content in other contextually relevant presentations based platform, format and targeting. 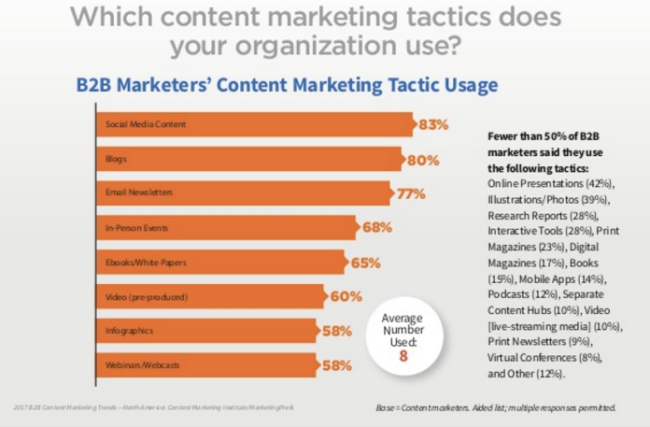 Based on 2017 B2B Content Marketing Research, marketers use an average of 8 tactics. Determine which options work best for your business and objectives. Where appropriate, schedule content repromotion. This is particularly important for content that seasonally relevant for a specific holiday or annual event. Use the same resources to produce related content including landing pages and welcome letters as well as different variations. Planning for this type of activity can minimize costs by eliminating one and done content and multiple efforts. After creating content, ensure that it’s optimized for your 5 key audiences to maximize reach. Go beyond the first week or the first month. Otherwise, your content risks be forgotten. 60-70% of content goes unused according to Sirius Decisions. (Note: This data is from 2013. 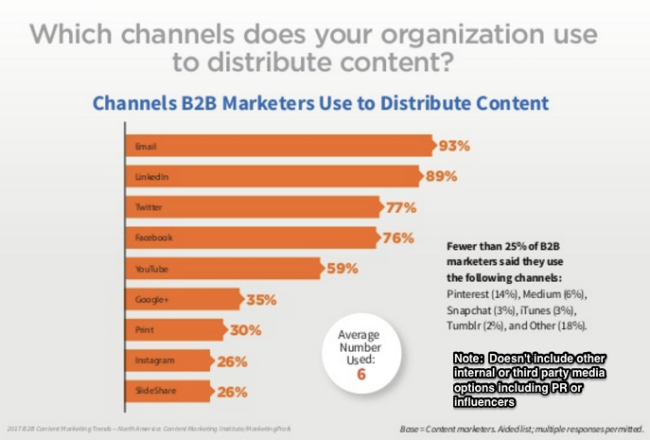 On average 2017 B2B content marketers use 6 distribution channels. Since these channels focus on email and social media platforms, there’s a good chance you can extend your distribution options. Explore broader opportunities for distribution your content using owned channels such as your sales, technical support, and customer service employees. Assess owned communications options. Support your content marketing with PR, search, third party media, influencers and advertising to expand your reach. 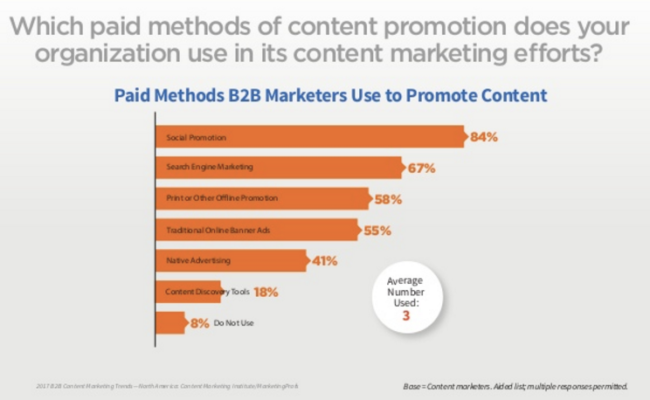 2017 B2B Content Marketing Respondents use an average of 3 paid advertising methods. Always be testing new platforms. While some of your content may be time or event specific, you should be able to squeeze more useful life out of your existing content through testing, measuring results and repromoting quality content. Among the key element to test for improved results are headlines, visuals, formats, calls-to-action, offers and platforms. Especially focus on attention getting elements such as headlines and images and format. Based on your business objectives, set specific goals for your content marketing. In other words, you should be able to measure your results. 80% of 2017 B2B Content Research respondents believe their organization will focus on lead generation in the next year. 57% of respondents measure lead quality; only 34% feel this metric truly measures their results. 50% of respondents measure sales; only 30% feel this metric truly measures their results. 47% of respondents measure lead quantity; only 23% feel this metric truly measures their results. Ensure your content contains a way to track performance. Also, check that your systems can tabulate the results. Plan for continuous improvement or it won’t happen. This means schedule promotion beyond a day, a week or a month. If your content is time sensitive, then it should be scheduled for the next relevant period. Or there’s a chance you’ll forget about it. 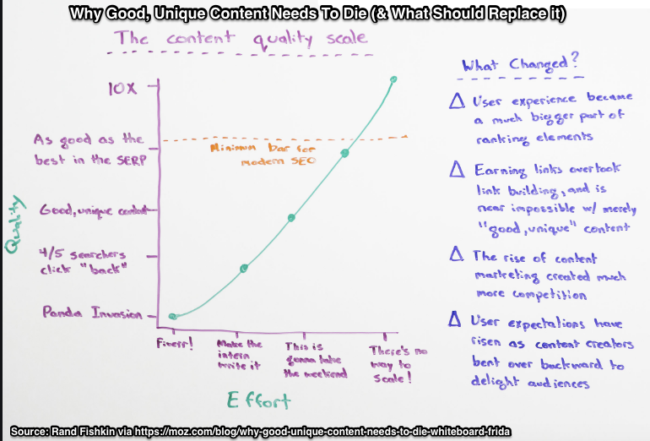 Use content curation to highlight existing content in new content where appropriate. In 2017, content marketers will need to set themselves apart by focusing on producing 10X content. To accomplish this, they’ll need to have a documented content marketing mission statement and related strategy that help achieve their business goals. By committing to content marketing fully, B2B marketers will work across their organizations to create best-in-class content that gets noticed. As part of these major content efforts, marketers will incorporate the means to track results including landing pages and related supporting content. With c-suite support, their efforts should eliminate extraneous one and done content yielding better content results. By planning for atomized content and repromotion, content marketers should extend the useful life of their content across a variety of formats and platforms. In the process, they should improve their ability to track results to their primary goals more effectively. BTW, I’m speaking at MarketingProfs B2B Conference next week on the topic of Not One and Done Content. Please join me if you’re attending. Tags 10X content, 2017 B2B Content Marketing Research, Andy Crestodina, Content Marketing Institute, Content Marketing ROI, Jay Baer, Joe Pulizzi, MarketingProfs, Michael Brenner, Rand Fishkin. Bookmark the permalink.